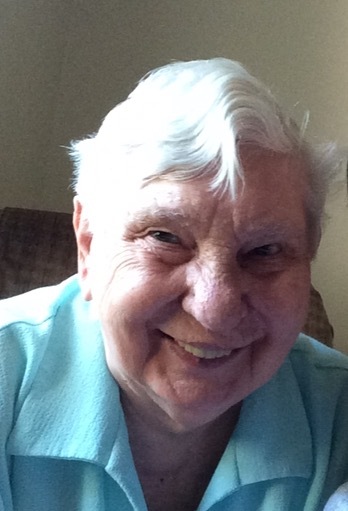 It is with heavy hearts that we announce that our dear mother, grandmother, and great-grandmother,Rose Lampertz passed away on Saturday, July 29, 2017, at the Brandon Regional Health Centre, with family at her side.Rose was born April 21, 1925 in Beho, Belgium the eldest daughter of Arthur and Irene Masson (Leonard). She grew up on a farm working side by side with her father which prepared her for her new life with her husband Rene, whom she married on December 2, 1950. In March of 1951 the newlyweds began a new life of farming in Canada, with stops in Napinka, MB, Alida, SK, then on to Dunrea. Before retiring in Brandon, Mom and Dad travelled back to Belgium a few times to visit. Children would be a large part of their new life in Canada. Mom would have seven children all the while milking cows, putting in large gardens, canning, carrying pails and pails of water, making all our clothes and knitting. She worked hard. Once her children were grown she devoted much of her time to her church, serving as eucharistic minister, knitting numerous tablecloths and doilies as raffle prizes, and donating dozens of pies for the foul supper. She also knit countless articles of clothing for Christmas Cheer. Mom is survived by daughters, Irene, Maria (Larry), Lorraine (Stan) and Rita (Greg), sons, Raymond (Audrey) and Roland (Michele), and son-in-law Grant, as well as 12 grandchildren and seven great-grandchildren. Also surviving are her sister Georgette (Pierre), brother Marcel (Lucienne), and sisters-in-law, Helene and Therese. Mom was predeceased by her husband Rene (2013), her youngest daughter Lucille (2001), also brother Roger, and sister Marthe. Prayers will be said at Memories Chapel, 330 18th Street North, Brandon, on Tuesday, August 8, 2017 at 4:30 p.m. Mass of Christian Burial will be celebrated at St. Felix de Valois Roman Catholic Church, 111 Wilfred Street, Dunrea, MB on Wednesday, August 9, 2017 at 1:00 p.m. with Rev. Fr. Philip Malayil as Celebrant. If friends so desire, donations may be made to St. Felix de Valois Roman Catholic Church Fund, Box 57, Dunrea, Manitoba R0K 0S0.